The combination of a killer head cold and the medication for said head cold has my thinking as jumbled as Jenga blocks in the tinker toy bin, so in lieu of the BRAND NEW banned books post I planned to finish for today, you get last year’s fabulous post, with some new pictures smacked in for good measure. And I get tea and bed. Thanks for reading! Do you find it strange that we have a Banned Books awareness campaign in the United States? I mean, seriously, is this something we actually need to think about here and now? Most Americans realize that banning books is a thing of the past, or something that happens in far off countries ruled by oligarchs, despots and fundamentalists. Right? As a book-lover, a writer, and a parent, this freedom is near and dear to my heart. The idea that someone could tell me which books are off-limits to read makes me angry. The thought that someone could tell me which stories to write makes me sad. The fact that people are trying to control what MY CHILDREN can and can’t read – because their judgement on what is best for my children is somehow better than mine – now that makes me furious. Over the past decade, more than 5,099* challenges were reported to the Office for Intellectual Freedom. To me, this was news. And it was shocking. 2. 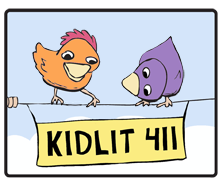 Talk with your kids about censorship, the First Amendment, and banned books. 4. Check out these videos of authors, celebrities and more reading banned books – and make your own video to share, too! 5. Watch a movie based on a banned book or one about censorship. How about Fahrenheit 451, Footloose, 1984, Harry Potter or Charlotte’s Web? 6. Watch the documentary Tell It Like It Is! (on Youtube in two, 7-8 min clips) about the dangers of book censorship. 8. Investigate censorship in your community by calling your local or school librarian and finding out if books have been challenged. Find out how books are chosen – or not – for your kids’ suggested reading lists, class assignments and school/classroom library. 9. Read and discuss a banned comic or graphic novel using the Comic Book Legal Defense Fund’s new, free discussion guides. 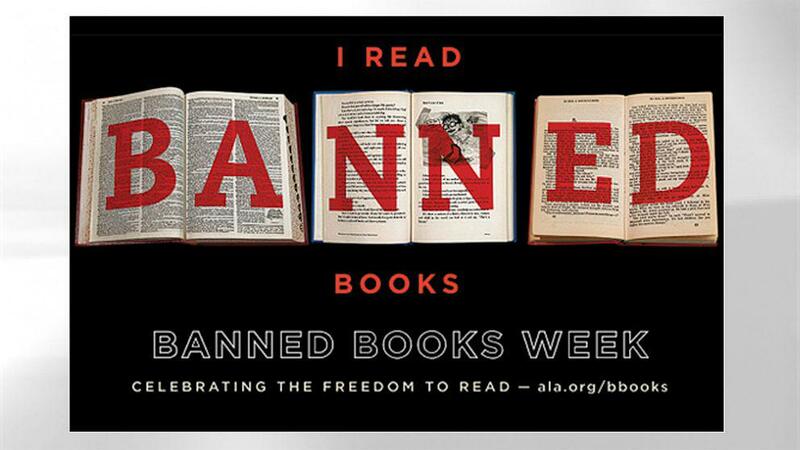 I’d love to hear how you, your family, school or library plans to get involved with Banned Books Week. Thanks for reading! 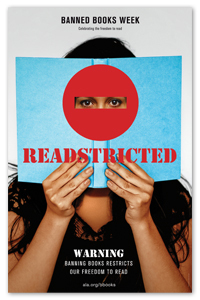 I hope you can join us at a Banned Books Read Out at the Cherry Hill Library this Saturday from 2:00 to 4:00 pm, Katey! Bring your kids and their books! That’s a great idea, Mieke! Love that the South Jersey Writers Group is putting on this event. We will try to make it. Thanks. Thank you so much for sharing this, Lauren! What an amazing way to raise awareness. So glad that people like you are out there spreading the word. I still say there has to be a way to make it possible for schools to have a system in which parents fill out a permission/consent form stating if THEY have restrictions for their children and what they are. Some things shouldn’t be governed across the board. Good point. Our school sends home permission slips for health class – I’m sure they could do so for a book the class was reading together. But how would they handle this for books that the child might choose from a classroom or school library? List every book that could potentially offend someone and get a yes/no? I’m not sure that would work out. 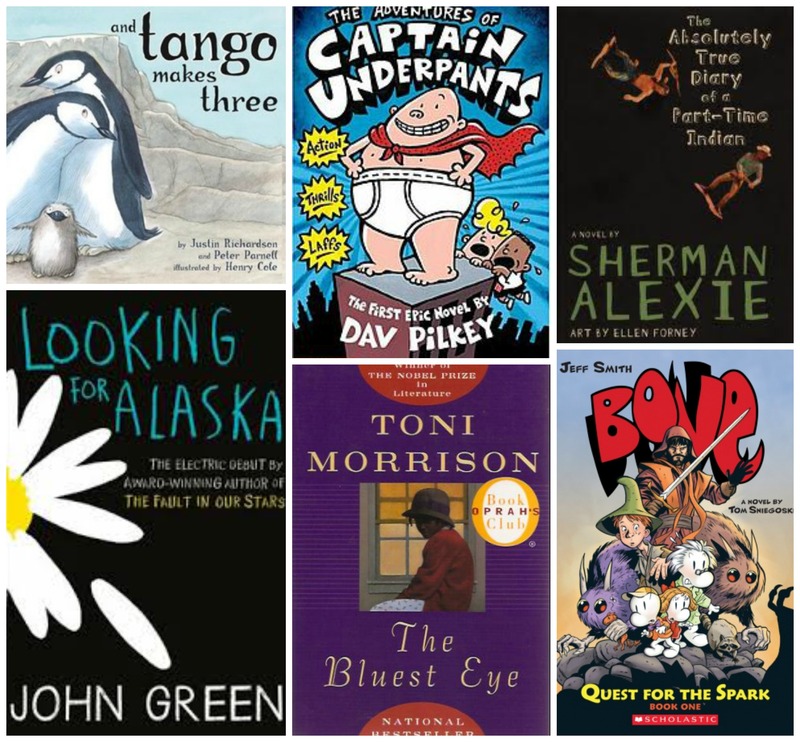 Ten things to do to support banned books! This is a post from the beginning of the week that I only just found, (sorry y’all, I’m behind on my reader), but most of these things work just fine the rest of the year too. This was a great read. I knew about books being banned by schools etc. but had no clue that there was an awareness campaign. Thank you. Thank you for reading and commenting! I’m glad to have helped you find out more about the campaign. Hey Katey, hope you’re doing well! Just stopping by to pin this post and Tweet a link for you. I’m doing that today for a bunch of people who wrote banned books post this week. Found this post from Hannah’s reblog at things matter 🙂 The “occult/Satanic” stat is a bit shocking. Gene’O, it’s always nice to hear from you! Thanks for sharing on social media. I’ve been knee-deep in revising a manuscript for a (potential) agent, so haven’t read many other blogs the last few weeks. I’ll have to drop by your sites soon to catch up! All the best to you! Congrats! and to you, too. So interesting! It’s true. Banning books is a terrible idea. It’s one of those catch 22s. It’s all well and good when they’re banning things we are offended by, but not so cool when they start banning books in schools that are books we enjoy. I tried keeping my boys from reading Captain Underpants. The books get on my nerves, have potty language, etc. All I did was create a bigger desire for those books. Lesson fully learned…..
I’m with you, Katey! I want to decide what my kids read. That is my call to make as the parent. My kids started to read banned books at an early age, and we always talk about the issues that come out of the experience as a family. It’s not always easy to explain controversial (or even just complicated) subjects to kids. Fiction can often help to get the ball rolling. I’m grateful to all the children’s authors who tackle the hard stuff, particularly in picture books. I wish more of them would do it. I’m glad to hear this from other parents! Just because a subject is controversial or awkward isn’t a good reason to lock it away. happy reading!